Where I live, the autumn has been splendid. Still days, mild sunshine and vibrant colours of leaves and berries. The late sunshine has meant that my chilies have belatedly ripened. I spent the last weekend harvesting them, and saving the seeds for sowing next February. The last couple of years I have had a bad experience with buying chili seeds on line. Many failed to germinate, and others produced fruit nothing like those advertised, Hence I now mostly grow my own seeds on. I have also seized every opportunity to make excursions to beach and woodland with my camera. One thing I particularly noticed: it has been an exceptional year for toadstools. This inspired me to go for a wild mushroom forage. We are blessed with a brilliant food market in a local town every Saturday, where there is a stall that sells an unbelievable array of wild mushrooms. 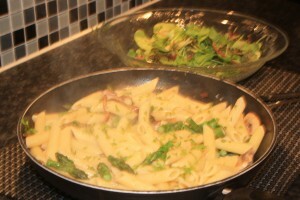 For this I used penne, but any other short pasta, such as farfalle, fusilli or conchigli would do just as well. The success of this dish has a lot to do with textures. The pasta and the asparagus should be al dente, to contrast with the silkiness of the beans, and the slight sliminess of the mushrooms. Meanwhile, clean the mushrooms (do not wash) and chop into penne-sized pieces. Chop the tips off the asparagus. If the remaining stalks are more than 10cm, cut in half. Blanch the asparagus stalks for 3 minutes, adding the spears for the last minute. Remove the asparagus with a slotted spoon, refresh in cold water, and dry on kitchen paper. Melt the butter in a small wok, add the wine, and boil until almost evaporated. Add the thyme, mushroom stock and cream and simmer for about 10 minutes. Heat the oil in a frying pan, and fry the mushrooms over a medium heat for about 10 minutes, Adding the garlic for the last 3 minutes. Wash and drain the haricot beans. Remove the thyme from the cream sauce. Add the mushrooms, asparagus and haricot beans. Season with pepper (and salt if needed), and garnish with parsley. Serve with a salad of mixed leaves, rocket, lightly-toasted pine nuts, and finely chopped spring onion.